Objectives: To compare “hospital at home” and hospital care as an inpatient in acute exacerbations of chronic obstructive pulmonary disease. Design: Prospective randomised controlled trial with three months' follow up. Setting: University teaching hospital offering secondary care service to 350 000 patients. Patients: Selected patients with an exacerbation of chronic obstructive pulmonary disease where hospital admission had been recommended after medical assessment. 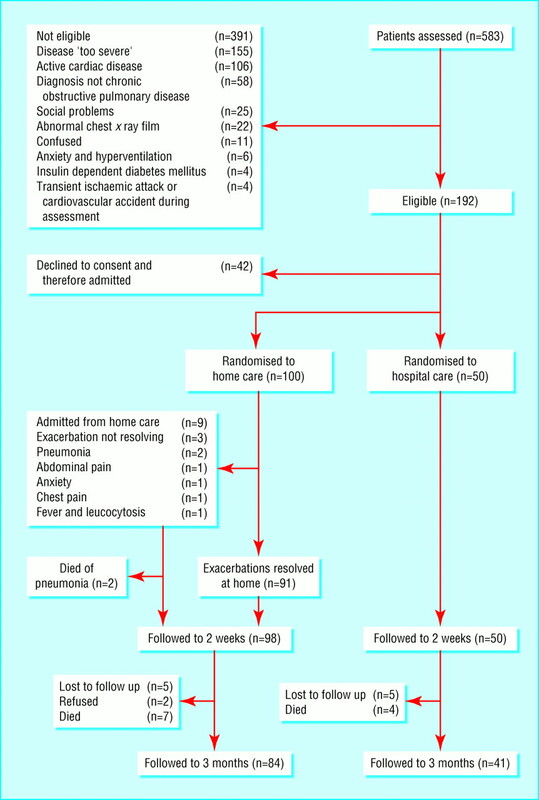 Interventions: Nurse administered home care was provided as an alternative to inpatient admission. Main outcome measures: Readmission rates at two weeks and three months, changes in forced expiratory volume in one second (FEV1) from baseline at these times and mortality. Results: 583 patients with chronic obstructive pulmonary disease referred for admission were assessed. 192 met the criteria for home care, and 42 refused to enter the trial. 100 were randomised to home care and 50 to hospital care. On admission, FEV1 after use of a bronchodilator was 36.1% (95% confidence interval 2.4% to 69.8%) predicted in home care and 35.1% (6.3% to 63.9%) predicted in hospital care. No significant difference was found in FEV1 after use of a bronchodilator at two weeks (42.6%, 3.4% to 81.8% versus 42.1%, 5.1% to 79.1%) or three months (41.5%, 8.2% to 74.8% versus 41.9%, 6.2% to 77.6%) between the groups. 37% of patients receiving home care and 34% receiving hospital care were readmitted at three months. No significant difference was found in mortality between the groups at three months (9% versus 8%). Conclusions: Hospital at home care is a practical alternative to emergency admission in selected patients with exacerbations of chronic obstructive pulmonary disease. Exacerbations of chronic obstructive pulmonary disease are the commonest cause of admission to hospital due to respiratory conditions, amounting to 1250 cases per year in our teaching hospital. This has a major economic impact and is an important factor contributing to pressures for beds in winter.1 Mortality from these episodes is closely related to the degree of hypercapnia and acidosis at admission and to the presence of non-respiratory comorbidities.2–4 As many patients presently admitted to hospital do not have these features it may be possible to manage them equally well outside the hospital environment. Initial attempts at community care for exacerbations of chronic obstructive pulmonary disease have produced mixed results, but the studies were small and the protocols more suited to extended community care than to managing the acute episode. 5 6 An alternative approach has been reported by Gravil et al who enrolled 962 patients with chronic obstructive pulmonary disease in an open study of hospital based supported discharge to the community.7 They found no greater morbidity in patients cared for at home, although there was a significant readmission rate (12%) in this group. This approach has been taken up enthusiastically throughout the United Kingdom,8 and it is being actively investigated in Barcelona and Palma, Majorca. Randomised controlled trials of this type of intervention have not, however, been reported. We hypothesised that selected patients currently admitted with exacerbations of chronic obstructive pulmonary disease could safely be cared for at home with sufficient support. In this trial, patients accepted for hospital admission with exacerbations of chronic obstructive pulmonary disease were intercepted in the accident and emergency department by the Acute Chest Triage Rapid Intervention Team (ACTRITE). Patients— The diagnosis of chronic obstructive pulmonary disease was based on standard criteria.9 An exacerbation was defined as increased breathlessness and an increase in at least two of the following symptoms for 24 hours or more: cough frequency or severity, sputum volume or purulence, and wheeze. The inclusion and exclusion criteria (table 1) were recorded on a set proforma. Patients gave written informed consent. The study was approved by the district ethics committee. Period of exacerbation— Patients were escorted home by one of the specialist nurses. Patients' general practitioners were faxed to inform them of patients being randomised to hospital at home care. Social support was immediately available if required. Nebulised ipratropium bromide and salbutamol with a compressor, oral prednisolone for 10 days, and antibiotics for five days were prescribed. Nurses visited the patients mornings and evenings for three days and thereafter at the discretion of the nurses. Evening and night cover was provided with the agreement of pre-existing services by district nurses. If progress was unsatisfactory the nurse or patient could trigger admission. Inpatients received the same drugs, with all other management being at the discretion of the ward team. Clinical responsibility for the patients remained with the hospital respiratory physicians until the exacerbations had resolved. At day 14 the forced expiratory volume in one second (FEV1) was measured in all patients after the use of a bronchodilator, and these measurements were repeated at three months. Principal outcomes were the number of subsequent admissions to hospital during the first two weeks of home care, the number of admissions to hospital in the three months after this period, and changes in FEV1 after the use of a bronchodilator. Secondly we examined health status in a subgroup of those randomised to the two treatment arms. Health related quality of life—A random subgroup of 90 patients completed a St George's respiratory questionnaire during the first week of the exacerbation. Fifty of these completed a second such questionnaire at three months. All questionnaires were administered by the specialist nurses. Statistical analysis—Data are presented as means (95% confidence intervals) unless otherwise stated. We used paired and unpaired t tests to compare data within and between the groups respectively for parametric data, and we used χ2 tests for non-parametric data. Data were analysed with Microstat version 1 and Microsoft Excel 97. All data have been analysed on an intention to treat basis. Overall, 583 patients were assessed from February 1998 to August 1999, of whom 192 met the entry criteria (figure). Forty two patients declined to take part and were admitted to hospital, leaving 150 patients. One hundred patients were randomised to hospital at home and 50 to hospital admission. The baseline characteristics of the patients in each group did not differ (table 2). Most patients had severe chronic obstructive pulmonary disease on British Thoracic Society criteria.9 At randomisation, 47 patients lived alone, 89 with a partner, 11 with their offspring, and three were “other.” No difference was found between the groups. Fifty five patients (37%) had started a course of high dose oral corticosteroids and 75 (50%) had started oral antibiotics within 2 or 3 days of randomisation, as prescribed by their general practitioners. No difference was found between these patients and the others for FEV1 after the use of a bronchodilator, duration of hospital or home care, or distribution between the treatment arms. Table 3 shows other concurrent treatment. Exacerbations were treated successfully at home in 91 patients. Nine required admission within 14 days of randomisation (figure). These nine did not differ in age, smoking habit, or social support from the others but their percentage predicted FEV1 after the use of a bronchodilator at randomisation was lower (24.9%, 9.0% to 40.8% versus 35.0%, 0.9% to 69.1%; P=0.004). Two patients died within 14 days of randomisation; both developed pneumonia which was not present clinically or radiographically at the time of randomisation. Twenty four patients cared for at home required social referral, with a median of 20 hours' care (interquartile range 12-28 hours). Fifteen patients were provided with home help for cleaning and shopping, eight with assistance for washing and dressing, nine with meals on wheels, five with night sitters, and three with day and night sitters. Patients had a mean of 11 (SD 3) home visits, and exacerbations settled within 14 days in 96 patients. Three patients were loaned an oxygen concentrator, all others receiving the standard treatment outlined above. Hospital admission—Of the 50 patients randomised to hospital admission the median stay was 5 days (interquartile range 4-7 days), and there were no deaths. Three patients admitted were referred for increased social support at the time of discharge. Two weeks —The mean percentage predicted FEV1 after the use of a bronchodilator in the home care group was 42.6% (13.4% to 81.8%). No patient had called their general practitioner during the exacerbation. The mean percentage predicted FEV1 after the use of a bronchodilator for those admitted was 42.1% (5.1% to 79.1%). Three months—The mean percentage predicted FEV1 after the use of a bronchodilator was 41.5% (8.2% to 74.8%) in the home care group and 41.9% (6.2% to 77.6%) in the hospital group. Readmission rates were similar between the groups despite the early readmissions from the home care group, most being due to further exacerbations (table 4). There was no significant difference in mortality between the groups (table 4). Of the 90 patients who completed St George's respiratory questionnaires during the exacerbation, total scores were higher in the 32 readmitted within three months (mean 77.1 (SD 15.9)) compared with the 58 not readmitted (67.4 (18.4); P=0.012). Data from repeat St George's respiratory questionnaires were available in 50 of 90 patients at three months; 34 received home care and 16 hospital care. Mean initial scores in the home care group were 71.5 (43.4 to 99.6) and in the hospital group were 71.0 (43.4 to 98.6). At three months there was no difference in the scores either from admission or between the groups. The score in the home care group had decreased by a mean of 0.48 (SD 16.92) and in those admitted to hospital by 3.13 (14.02). As chronic obstructive pulmonary disease progresses the effects of intercurrent viral and bacterial infection11 are more difficult to manage by simply intensifying routine medical treatment, and several factors, including hypoxaemia and limited social support, have been suggested as indicators for admission to hospital.9 Previous studies of “hospital at home” care have reported small numbers of poorly characterised cases or have used sustained intervention over several months to reduce admission rather than addressing the specific problem of the care of patients with acute exacerbations of symptoms who would otherwise be admitted to hospital. 5 6 This is the first prospective randomised study to show that hospital at home run from the accident and emergency department and not involving an overnight hospital stay is as effective as conventional hospital management in some exacerbations of chronic obstructive pulmonary disease. The two randomised groups were well matched for age, at admission FEV1 after the use of a bronchodilator and initial treatment. They were more severe, as assessed by spirometry, than those in other recent studies of exacerbations of chronic obstructive pulmonary disease in the United Kingdom but were selected to be relatively normocapnic and not acidotic. 5 12 The two deaths were due to pneumonia and were not secondary to respiratory failure complicating chronic obstructive pulmonary disease. This supports the use of our selection criteria when contrasted with an overall mortality of 14% in unselected patients.13 The encouraging results of the study are that it may be possible to relax the inclusion criteria, particularly with regard to hypoxaemia in the absence of hypercapnia as this could be corrected by supplying patients with oxygen at home. Unlike previous reports, patients eligible for our study had been referred for hospital admission either by their general practitioner or by an emergency physician. Randomisation occurred in the accident and emergency department without a preliminary overnight stay. We followed our patients for three months and found no differences in mortality, admission rates, or health status between the groups at this time. Since the trial has ended only 17 of 116 (15%) patients eligible for home care have refused to be managed at home. Only one third of patients assessed proved suitable for inclusion in our protocol. This reflects the high incidence of other diseases and the presence of major respiratory acidosis and important social problems, all of which merit hospital care. We believe that hospital assessment is necessary to exclude major comorbidities and to perform radiographic and blood gas analysis. Although this intervention in exacerbations of chronic obstructive pulmonary disease meeting our criteria has proved to be safe and acceptable, it is unlikely that all patients can be managed in this way and a significant provision for those who are admitted will continue to be needed. Now knowing the readmission rates in each group, we would need over 3000 patients to show a 5% difference in readmission between the groups, which is beyond the scope of a single centre. Given the satisfactory resolution of most of the exacerbations at home we believe that further study should be directed at examining the optimal number of home visits, the impact of the availability of immediate social support, and cost benefit issues. We did attempt to study patient satisfaction in a subset of our population, but administrative problems precluded an adequate sample size. The 17 patients, however, were satisfied with home care. Our study shows that home care organised directly from the accident and emergency department is a practical alternative to emergency admission in properly selected patients with exacerbations of chronic obstructive pulmonary disease. We thank A Shaw for supporting the case for a randomised controlled trial, S Callaghan for helping to set up the Acute Triage Rapid Intervention Team, A Townsend-Rose for assessing and managing many of the patients, and S White for statistical advice. Contributors: LD, PMAC, and RMA were involved in the planning of the service and study. LD and MW collated and analysed the data. SB led the team of specialist nurses, and MW and LD undertook the medical assessments of the patients. LD, PMAC, and RMA interpreted the results and wrote the paper. RMA will act as guarantor for the paper. Funding North Mersey Community (NHS) Trust and University of Liverpool.
. Burdens of disease: a discussion document. Leeds: Department of Health, 1996.
. Hospital and 1-year survival of patients admitted to intensive care units with acute exacerbation of chronic obstructive pulmonary disease. JAMA 1995;274:1852–1857.
. Acute hypercapnic respiratory failure in patients with chronic obstructive lung disease: risk factors and use of guidelines for management. Thorax 1992;47:37–40. et al. Outcomes following acute exacerbation of severe chronic obstructive lung disease. Am J Respir Crit Care Med 1996;154:959–967.
. Randomised controlled trial comparing hospital at home care with inpatient hospital care. I: three month follow up of health outcomes. BMJ 1998;316:1786–1791.
. An innovative home care program for patients with chronic obstructive pulmonary disease. Chest 1991;100:607–612.
. Home treatment of exacerbations of chronic obstructive pulmonary disease by an acute respiratory assessment service. Lancet 1998;351:1853–1855.
. Winter meeting abstracts. Thorax 1998;53:70–2A.
. Guidelines for the management of chronic obstructive pulmonary disease. The COPD guidelines group of the standards of care committee of the BTS. Thorax 1997;52:1–28S.
. One year's experience of home care as an alternative to hospital admission in exacerbations of chronic obstructive pulmonary disease (COPD). Thorax 1998;53(suppl 4): A71.
. Antibiotic therapy in exacerbations of chronic obstructive pulmonary disease. Ann Intern Med 1987;106:196–204.
. Quality of life and hospital re-admission in patients with chronic obstructive pulmonary disease. Thorax 1997;52:67–71.
. Audit of acute admissions of chronic obstructive pulmonary disease—standards of care and management in the hospital setting. Eur Resp J 2000 (in press).